Ten Speed Press, 9781607747833, 272pp. A practical career guide for creatively inclined job seekers of all ages, with tips and counsel on how to use your independent and innovative talents and passions to make money, express yourself, and find a job you love. This new edition of the popular guide for individuals seeking work that suits their unique skills has been completely revised and updated to reflect the freedom offered by the new work order, delve more deeply into freelancing as a career, explore social media as it relates to creative job searches, provide new success stories, and bring all salary information up to date. It also includes descriptions of more than 270 creative jobs, from the mainstream (architect, web designer) to the unexpected (crossword-puzzle maker, police sketch artist). 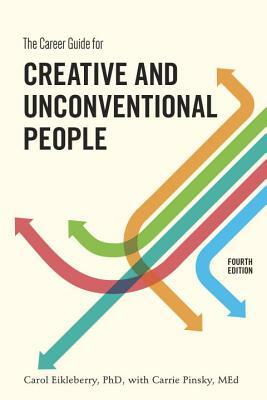 With knowledgeable career guidance, real-life success stories, and eye-opening self-evaluation tools, the fourth edition of The Career Guide for Creative and Unconventional People helps unique individuals find work that supports and compliments their personalities and passions. CAROL EIKLEBERRY, PhD, is a psychologist who has worked as a career counselor for more than 20 years, both in private practice and at university counseling centers. CARRIE PINSKY, M.Ed., is a career counselor in private practice and a freelance writer. —RICHARD N. BOLLES, AUTHOR OF WHAT COLOR IS YOUR PARACHUTE?